Are you contemplating adding a glass entrance door to your home or business? 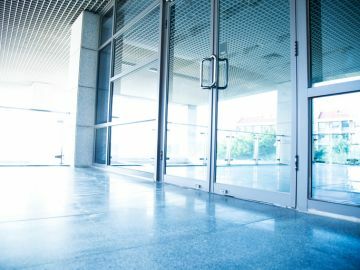 Aluminum-framed glass doors are the most common types of commercial glass doors installed in Bridgewater Massachusetts. Glass and aluminum doors doors provide an elegant look and a solid, secure entrance. Glass panels allow natural light to shine inside, increasing mood and productivity. The aluminum frame offers a lightweight, attractive, yet secure foundation. Patriots Overhead LLC can install glass entrance doors to fit any size commercial opening, from a standard garage door to an entire storefront. If you are looking to add pizzazz to your commercial building, consider a glass and aluminum door installation. Contact the door experts at Patriots Overhead LLC. Call (401) 384-6384 for more information or a free quote. Glass and aluminum doors are frequently used for retail and commercial entrances to add an elegant statement and enhance curb appeal. They are available in a wide variety of styles, colors and options to adhere to your schematics and whim. Don't let the many options paralyze you. The door pros at Patriots Overhead LLC will help you choose a model that fits your desired purpose and budget. When it comes to glass and aluminum door installation in Bridgewater businesses and homes, there are many factors to consider. Working with the professional door folks at Patriots Overhead LLC just makes sense. We understand and fully comply with local building codes as we select and install glass and aluminum doors in Bridgewater. Choose the door contracting company that can get the job done right, the first time. Following manufacturer’s guidelines will ensure a properly operating door and will keep your warranty in good standing. When Patriots Overhead LLC installs your glass and aluminum entrance door, you’ll be sure to enjoy quality craftsmanship and all the benefits that a well-crafted and installed glass entrance door delivers.